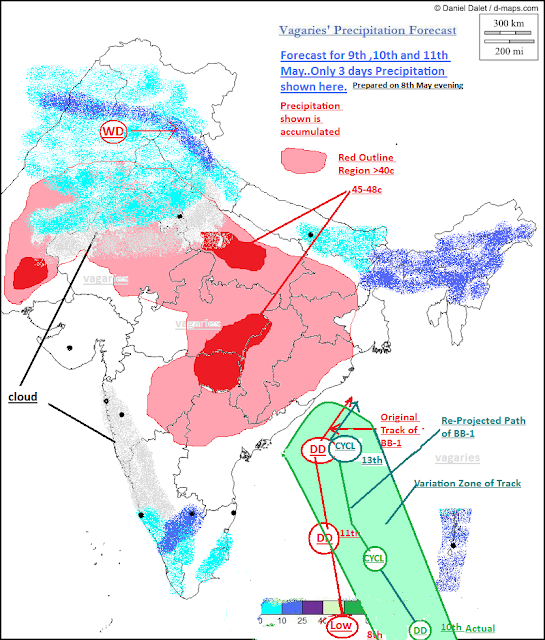 Posted on 10th May @ 10.15 pm IST..Track and Posiyion of BB-1 Re-Produced on previous Map.. The Low Pressure in Bay of Bengal is located 5.4N 89.8E. again going by visualization of satellite image I expect the next update to place the center SouthEast of current location. Hence the ultimate track would start from more Eastwards than shown in track. Ugaap: Yes, could be possible..Thanks. 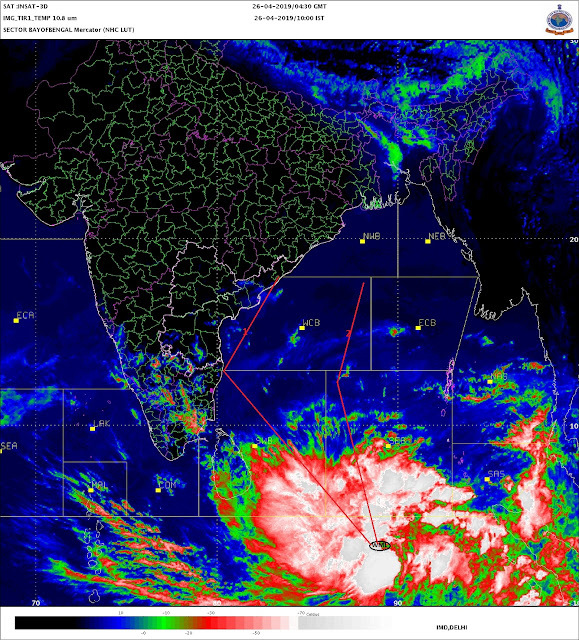 Arabian sea, monsoon branch is gathering momentum .showing good progress. First 46 deg of 2013 in Nagpur. Isnt it early. Shitij: Replying to your query put on fb..for more readership. 1. Forecast is specifically given for next 3 days...and the stregth of BB-1 is given till 13th May. Nagpur Star (Amit): No, it is not early, in fact if you are following the MW series, you will see from the MW-3 of 2010 and 2009 how the temperatures have risen in May..
Sam: Do you remember the "false alarm" I put up in my earlier article ? Very humid weather in bangalore. It clear , sunny and humid right now. I can see huge TS east and south east of bangalore from my office. I guess its about 80 kms from the city. Hope it comes in and does not slid south towards anekal and kanakapura. On doppler radar, find the TS east and south east of bangalore to be quite big. Its almost 60 kms from North to south. Thanks for the reminder, Rajesh sir,Today in calangute Goa there was a moderate shower early in the morning, since i have come on a holiday here in Goa, weather is much comfy then Mumbai. Nice rain yesterday in south bangalore. Rain started around 8.00 pm as drizzle. From 10.10 to 10.30 heavy rain. Best spell of the year in terms of duration. Wish the rains would last for few more days in bangalore. Its a clear and humid day here. On doppler radar find TS around 120 kms east of bangalore. Not sure whether they can come in later today. Heavy rain in north bangalore areas around Hebbal. Nothing in south bangalore. heavy rain witnessed in south bangalore on yesterday for 30 mins. hope it will continue for today also. thanks for your forecast. Bay low pressure seems to move NE towards Bangladesh/Orissa/Andamans... Very very bad for south India. We all expected TN/KAR/AP. I guess arrival Western disturbances has turned low away from South India. TN stations are always noted for their 40c and above..
Bangalore getting good showers today (Friday)..
Rajesh sir, keeping your point in my mind,about the 'false alarm' regarding the arabian sea monsoon branch' yet' why it looks like plently of monsoon clouds developing and moving quickly towards kerela coast ?. sam: there is some confusion , or my explanations are not proper. The "false alarm" was said for the MJO which had developed as a weak phase around 1st/2nd May..and it was thus mentioned. The MJO has since moved east, and what was sais on 30th april was that MJO moves east and creates a conducive environment for a low..which happened..and moved into the Arabian Sea. Now , BB-1 is another story. The clouding I meant as "false alarm" is gone and over last week, and current clouding is a rush of westerlies towards BB-1. can you post your e mail, or otherwise e mail me directly, maybe can explain better.. Thank's Rajesh sir for clearing my doubt's.my email id- shamshadk110@gmail.com. sir,tonite what time are you going to post the next part of the monsoon watch series. GENERALLY, POST MONSOON(OCT,NOV) STORMS ARE BIGGER AND INTENSE THAN PRE MONSOON STORMS (APR,MAY)..
so is it dying in the sea itself? ?Or more projections later...? ?